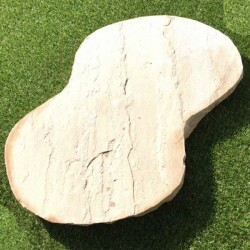 Natural sandstone paving is a popular choice amongst those who want something a little unique and exquisite to transform their patio or driveway. Each and every paving slab is ever so slightly different, from it’s colours through to it’s profile and veining; something which offers the opportunity to create a stunning space which blends perfectly with it’s surroundings yet still stands out in it’s own unique way. Honed and Sawn: The Honed and Sawn finish offers a contemporary and stylish look to any patio or commercial space. The Honing process results in a completely falt surface on the face of the paving stone. The sides are also straight cut (Sawn) unlike the natural riven paving that has hard edges. The Sawn sides also adds to the contemporary finish of the paver. Shot Blasted and Sawn: The Shot blasted and Sawn finish also offers a contemporary and stylish look to any patio or commercial space. The Shot-blasting process results in a textured orange peel effect on the face of the paving stone. The sides are also straight cut (Sawn) unlike the natural riven paving that has hand-cut edges. The Sawn sides also adds to the contemporary finish of the paver. Brushed and Tumbled: The Brushed and Tumbled finish is the closest to the pavers natural state. The edges have literally been ‘tumbled’ to produce a more worn and smoother appearance. The surface is then brushed which results in a smoother finish making it ideal for indoor purposes as well as the exterior. Speak to a member of our sales team for more information. Black sandstone is the perfect shade if a traditional Aged Yorkshire shade is desired. 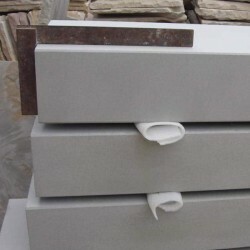 A dark grey b..
Of all the sandstones, Kandla Grey is the most contemporary, being very consistent in colour and is .. If you like the darker tones in Mint Fossil, then this colour may be ideal for you. Lalitpur Yellow ..
Mint Fossil Natural Sandstone Paving is a colour which has an attractive variation in shades, f..
Modak provides a striking blend of colours with a pinky backdrop and distinctive veining. 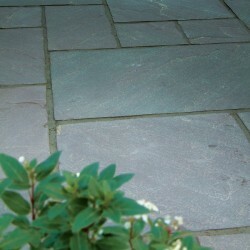 Shad..
Raj Green Paving is one of our most popular colours and it is no surprise why. 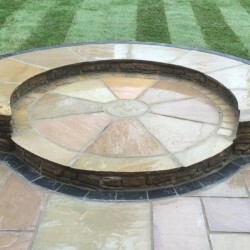 It blends with most s..
Our calibrated cobbles/setts are designed with ease of fitting in mind. Each cobble/sett is cut to 3..
Raveena is a mix of purplish colours, set against a pale, grey and buff background. 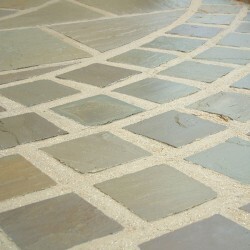 It is very strik..
For a really multi colored paving style, then we have a few options namely, Rippon, Modak and Raveen..